"Well made leather bridle that clearly shows love and passion in every stitch." "It is not easy to find a collar small enough for our tiny Sheltie, she is smaller than a cat, weighing only 3.5kg, but I was delighted when Carolyn said she would be able to make this tiny little collar. It has been beautifully constructed in lovely soft brown leather and was delivered within a week of ordering. "This collar has proved superb for an exhuberant water favouring spaniel, much appreciated." 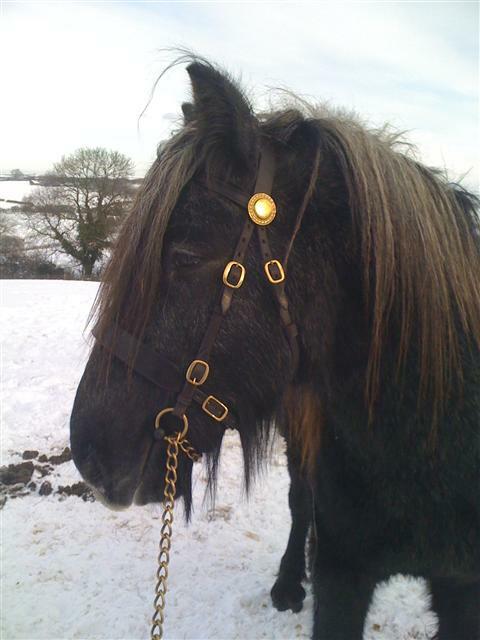 "I am very pleased with Musk's new bridle, he is an "in-between" size with his head being a little on the large side for a Cob and too small to be a proper Full size so a bespoke bridle is just the ticket. 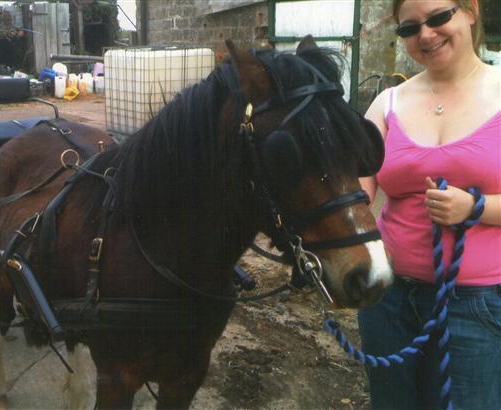 I'm hoping that I will be able to get a saddle to match once you are ready to start making them professionally - as you know our native breeds can be quite flat across the withers but still relatively short in the back – hopefully both saddle and he will be ready for the showring in 2011. "I have found this a very durable lead, which has suffered much weather and conditions with little to no real care. Thank you,"
"I am writing to thank you for the beautiful bridle you made for Roo and Myself. It fits him perfectly and we are steaming along happily with our training. I have enclosed a picture of us getting ready to go out as a thank you and to show you just how superb he looks in it. Thanks again." "The noseband arrived yesterday and it's perfect, thank you so much! Have attached a photo 'in situ'! Thanks very much,"
"Thank you for the bridle work, it’s beautiful and exactly what we needed.... I will also see if I can put a note in the Icelandic horse society journal for you too. I’m very pleased with all of it."